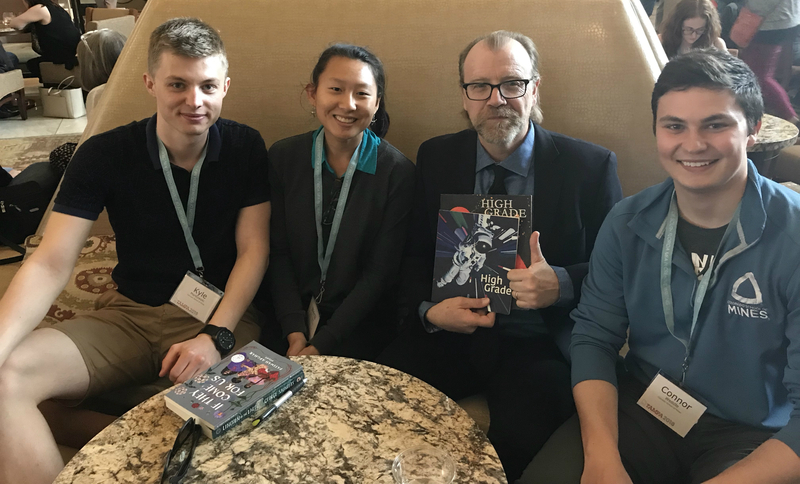 Three editors of Colorado School of Mines' literary and arts journal received some extra-special inspiration at the Association of Writers and Writing Programs Conference in Florida: They got to meet with Man Booker Prize-winning author and Mines alumnus George Saunders ‘81 before he delivered the event’s keynote speech. High Grade co-editors in chief Wenli Dickinson, a senior in environmental engineering, and Kyle Markowski, a senior in chemical and biochemical engineering, and art editor Connor Weddle, junior in mechanical engineering, met with Saunders a couple of hours before he gave his address. The AWP Conference, held March 7-10 in Tampa, brings together writers, teachers, students, editors and publishers for workshops, panels and lectures on a variety of topics. Saunders received his bachelor’s degree in exploration geophysics from Mines in 1981. He worked in Sumatra as a field geophysicist following graduation, but returned to the United States after getting sick and decided to pursue his passion for writing. A few years later, he was accepted into the MFA program at Syracuse University, where he teaches today. Saunders has received numerous awards for his short stories and essays. In 2017, Saunders received the Man Booker Prize for his first full-length novel, “Lincoln in the Bardo.” An interview with Saunders was featured in the 2015-2016 issue of High Grade. “[“Lincoln in the Bardo”] was particularly experimental, which suits my preferred reading and writing style,” Markowski said. “After finishing the book, I was exceptionally excited to meet its author." While at AWP, the three editors also had the opportunity to share copies of High Grade with other literary journals exhibiting at the conference's book fair, which takes place every year. For both Markowski and Dickinson, being a part of High Grade has been instrumental to their experiences at Mines. The 2017-2018 issue of High Grade will be released April 20, with a release party from 5 to 7 p.m. at Foothills Arts Center.